The luxurious pool has lap lanes for adults and water fountains for the kids. The generously-sized rental residences are a great place for the family to unwind. Grab something sweet or pick up a quick snack. Sometimes a cold one is all you need. The sandy area by the pool is a nice place for kids to play while you relax. You get free shuttle rides to Disney World, Universal, and SeaWorld. Bring your cat or dog for a $200 service fee. Head to the Palm Cafe by the pool for lunch, snacks, or a refreshing drink. All condos have jetted tubs – pamper yourself with a bubble bath and a good book. Floridays Resort Orlando was TripAdvisor’s #1 Family Hotel in the US in 2016 and received a 2017 Traveler’s Choice Award. After getting settled into your condo, change into swimsuits, grab pool toys and water wings and slather everyone with SPF before heading to the Grand Pool Complex. If you’re looking for lots of action, the oversized pool with lap lanes and spraying fountains has you covered. Weekly poolside activities include games and arts & crafts. Order a refreshing drink from the poolside bar and catch up on your celebrity gossip while the little ones play in the fountains or build sandcastles in the poolside sandy beach area. If you’re looking for a more relaxing swim, visit the quiet pool. On your way back to your condo, stop by the Palm Cafe & Marketplace. Let the kids pick out snacks and get your mid-afternoon caffeine fix; the Marketplace serves Starbucks (score)! Two- to three-bedroom condos sleep six to ten guests and feature Mediterranean-style decor and balconies with lake or pool views. Full kitchens (with granite countertops and Keurig Coffee Makers) allow you to save money by making your own meals. Bring the kids along to Publix to stock up on groceries and ensure that no one's favorites are forgotten. Let the kids get creative and make their own sandwiches for lunch. Declare the sandwich with the most unusual ingredients the winner and the sandwich artist official movie-chooser. Flatscreen TVs with DVD players are perfect for enjoying a family movie. Bring favorites from home and watch one while you’re eating. Take advantage of the in-suite washer/dryer when the kids end up with ketchup on their clothes. Vacations can be bittersweet if you have to leave your four-legged family member behind. Thankfully, Floridays Resort Orlando is pet-friendly, so you don’t have to worry about that. Don’t feel like cooking dinner? No problem. Palm Cafe & Marketplace offers room service. Once the kids are asleep for the night, relax with a soak in the jetted tub. 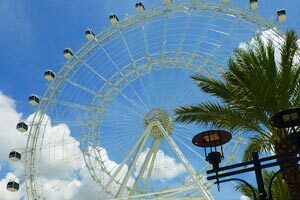 Floridays Resort Orlando offers a free shuttle to the major theme parks (be sure to call a day in advance to secure your spot). SeaWorld® features rides, animal shows and animal experiences. Experience Kraken Unleashed, a floor-less virtual reality rollercoaster. Thrill seekers will love Orlando's tallest, fastest and longest rollercoaster, Mako. Little ones will love the Flamingo Paddle Boats and Shamu's Happy Harbor. Shows include orca, dolphins and sea lions. Animal Experiences feature dolphins and penguins. Universal Orlando® is made up of two major theme parks. Universal Studios® is home to Transformers: The Ride 3D®, Shrek 4-D® and Race Through New York® Starring Jimmy Fallon. The Wizarding World of Harry Potter® – Diagon Alley has Flight of the Hippogriff and Harry Potter and the Escape from Gringotts. Catch the Hogwarts Express at King’s Cross Station (with a park-to-park ticket) and visit The Wizarding World of Harry Potter® – Hogsmeade, located at Universal’s Islands of Adventure®. Dine at Three Broomsticks or ride Harry Potter and the Forbidden Journey. When you’re ready to venture beyond the Wizarding World, there’s The Jurassic Park River Adventure®, The Amazing Adventures of Spider-Man® and The Incredible Hulk Coaster®. Walt Disney World’s® Magic Kingdom® is where you will find Disney’s most classic attractions. Jungle Cruise®, Big Thunder Mountain Railroad® and Pirates of the Caribbean® are just a few of the many rides. Check out New Fantasyland®, the newest area in Magic Kingdom®. Commercial vehicles or trucks are not permitted in the resort parking lots. Note: Transportation for Floridays Resort Orlando is provided Metro Transportation 407-857-8557. Reservations and vouchers are required for all transportation. Shuttle times are subject to capacity, traffic and weather conditions and may occasionally run late. Be at designated area 10 minutes prior to departure. For riders with disabilities and wheelchairs, please call for a reservation at least (24) hours prior to boarding.